Ugh, it’s Monday yet again. Doesn’t it seem like the weekends fly by in like 2 hours and then the work week takes 3 weeks to get through? I am SO over it! Anyway maybe the new Alice in Wonderland collection by OPI will help cheer us up! This is a limited edition collection and inspired by Tim Burton’s soon-to-be released movie. Now if you have been reading my blog for awhile, you know I am a HUGE Tim Burton fan. I want to live inside his movies, I love his vision so much! So of course I needed to try this collection out. Oh and just as an FYI, the weather hasn’t been cooperating for weeks now (on the weekends anyway), so I had to swatch these indoors under two lamps with incandescent light bulbs. They actually didn’t come out as horrific as other indoor swatches I have done in the past I think it’s because my new camera is just so awesome. But the glitters just aren’t as glittery and shiny as they would be in the sun, so take heed! Off With Her Red! is an orange/red creme. This one doesn’t really interest me that much, it’s been done so many times before I think. The formula was great on it though, and I only needed two coats. Mad As A Hatter is a seriously glittery polish. There is green, blue, purple, pink, silver, orange and every other color of micro-glitter packed into this suspended in a clear base. I needed three thick coats to get full nail coverage. Thanks So Muchness! is a berry red shimmer. It’s got some red micro-glitter in it as well, which is subtle and isn’t totally in your face. This is a really pretty color (indoors pics don’t do it justice) and very flattering on fair skin. This was two coats. 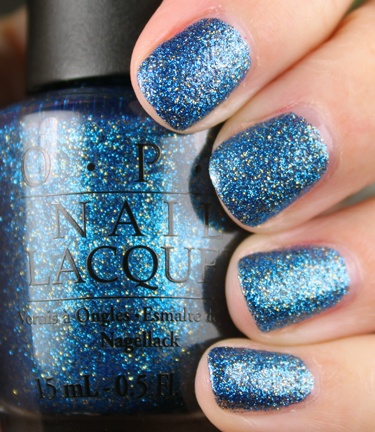 Absolutely Alice is a blue base packed with blue and gold micro-glitter. This was my favorite of the bunch because it’s very unique and I love the blue. I’m not a huge fan off glitters suspended in clear polish. For me the only use for them would be as a layering color, but this you definitely get major color impact. This was three coats. The Alice In Wonderland collection is available on Transdesign here already, and it’s $4.99 per bottle. It should be available in other stores and online shortly as well. What do you guys think? Who’s going to get some of these and who’s going to the movie in March? You KNOW I’ll be there!!! The Vampy Varnish Collection Giveaway! Love this, I ordered Mad Hatter, Absolutely Alice & Thanks So Muchness. Can’t wait for them to arrive. .-= Suzanne´s last blog ..GOSH Rainbow Nail Lacquer =-. Yay, the glitters are so cool! I’m ordering Absolutely Alice and Mad as a Hatter this morning. I look terrible in red so I’m not the slightest bit interested in the others. I think that OPI missed a great opportunity to do something with pink/purple and call it something based on the Cheshire Cat. I totally agree, I think the two reds should have been some amazing colors, not red. Again. I bought the MAD HATTER one because I thought it was so unique and different. I just love it. The other ones I could take of leave. I am not a fan of blue nails and well OPI already has a million reds which I find are better then these! A little more originality for this collection would of been best! Totally agree about the reds, we need more interesting colors and finishes! I love Absolutely Alice! But since I live in Sweden it’s probably going to be hard to find it 🙁 Well I have to live through the pictures. And I will also definetly see the movie! The two glitters are amazing and I am very excited to see the movie. Is Off with her Red less glossy than usual? No, it’s the same glossiness as usual. The pics might make it look “duller” since it’s not in the sun. I am in love with Absolutely Alice and Tim Burton films! So excited! .-= Marina(Makeup4all)´s last blog ..Chanel Les Deux Levres Glossimer Set. Review & Swatches =-. I’m wearing Absolutely Alice right now. It’s the only one I had to have! I totally agree about having better colours though… What about a purple or pink for the Cheshire Cat? Or silver called the Looking Glass. So many possibilties! I’ve been wearing Mad as a Hatter since Friday and I still don’t want to take it off! 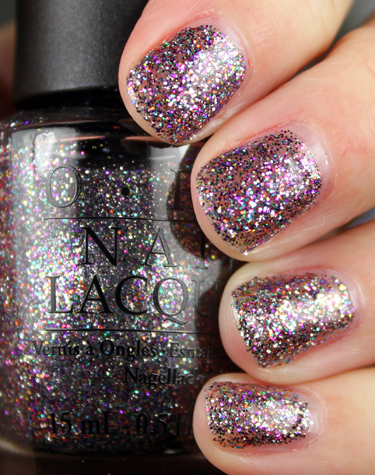 It’s my new favorite glitter ever! .-= Andrea´s last blog ..OMG, what has MAC come up with now? =-. I received Mad as a Hatter and Absolutely Alice last week, my first OPI purchases ever. I’m really in a glitter phase right now even though I love my cremes. Plus I bought a bunch of the China Glaze glitters for layering. I got Mad as a Hatter and Absolutely Alice coming. I am anxiously sitting by the door waiting for them to get here! .-= Danica´s last blog ..Pure Ice – Twinkle =-. I’m curious, what camera you use to take your swatch photos? I still can’t figure out the macro setting on mine (or if it even has one…) Thanks! I like the red shimmer polish! About a month ago I got a Canon Rebel T1i, so my pics from December on have been with that. I was using a more compact Canon, the Elph DS 990IS. I LOVE Tim Burton movies so I definitely want to go see this. Not sure whether to just buy the two glitters, or get the pack of minis in the cute little box. I am rather fond of the diddy OPI bottles! Just a question. How many coats is that Alice? I absolutely adore it. I look forward to when it comes out. .-= Perry´s last blog ..OPI Concerto in Copper =-. .-= Michèle´s last blog ..Claire’s Minty Mani =-. I’ve said it before and I’ll say it again… *YAWN*!! I’m extremely unimpressed by this collection, it should have been so much more. MaaH is interesting but not really my style, AA looks gorgeous and is about the only one I’d consider getting. .-= Nicole´s last blog ..Happy New Year! =-. I think the only ones I’ll be getting for sure are Absolutely Alice and Mad As A Hatter. For the other two, I think I’ve seen them all before, so I’ll pass. .-= Samantha´s last blog ..Tagged: One Lovely Blog Award =-. I think I need Absolutely Alice! I’ll definitely see the movie, but I’ll pass on these polishes. .-= Solveig´s last blog ..Sephora Stormy Pink =-. oh man, i can’t wait to get these and the urban decay palette! are you getting the urban decay palette? I do like Absolutely Alice, but I like Reflecting Pool better so I think I’ll pass on these. .-= TipsToToes´s last blog ..Portuguese Nail Polish: Nails 4 Us =-. Thanks so much for the beautiful swatches! I ordered Absolutely Alice and Mad as a Hatter, but MaaH looks pretty sheer, and I’m thinking of layering it over something. Maybe Brand New Skates? I’m not sure, do you have a suggestion? Thanks for the swatches. I just received the whole collection today. I can’t wait to try all of them. I love all of tim burton’s films. He has a interesting imagination. My two boys favorite film is the nightmare before christmas. Anyway back to the nail polish, I actually thought the reds really look pretty. Off with her head looks like a tomato red and thanks so muchness has red/pink flakes of glitter. I also thought they could’ve come up with more interesting colors inspired by other charecter from the film. I really want the two glittery ones. hhhmmm I wonder if anyone owes me a favor? I am sticking to my no buy no matter what. .-= marisol´s last blog ..2010 Resolution Suggestions =-. I love them! I actually saw them in Walgreens. I’m going to pick them up for me and my daughter! Can you please email me the sellers name? kelly@vampyvarnish.com. Thx! I’m a little disappointed 🙁 I think I’ll check out the glitters but I was hoping to be wow-ed by this collex since I <3 Alice in Wonderland! .-= Mary Clark´s last blog ..Benefit Coralista, Peachy Please! =-.